^ Hansen, Drew D. (English). 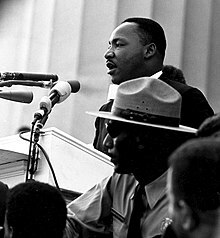 The Dream: Martin Luther King, Jr and the Speech that Inspired a Nation. New York, NY: HarperCollins Publishers. pp. p. 177. ISBN 978-0060084769. ^ Branch, Taylor (English). Parting the Waters : America in the King Years 1954-63. New York, NY: Simon & Schuster. ^ Estate of Martin Luther King, Jr., Inc. v. CBS, Inc. , 11th Cir., 98-9079 (Nov. 5, 1999). 47 Years Ago in Detroit: Rev. Martin Luther King, Jr. Delivers First "I Have a Dream" Speech （英語） - Democracy Now!